In North Tyneside, more than 140 businesses have closed up shop, leaving the High Streets looking somewhat desolate and empty. Knowing that a deserted shopping area can discourage other businesses from moving in while it encourages even more to pull out, the North Tyneside council decided to try a radically unusual approach: they’re faking it. The council is funding a project to install fake storefronts onto vacant retail spaces. The first stage of the project was transforming a deserted clothing store into a delicatessen. A removable covering reading “Delicatessen?” was installed over the shop’s existing signage, and a brightly-colored picture depicting the interior of a busy deli was installed behind the shop’s large windows. 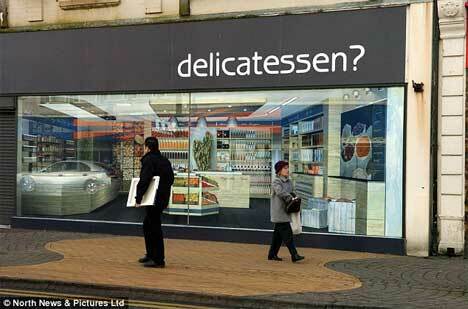 The picture helps passers-by to imagine what the shop might look like if it actually were a delicatessen. The council hopes this bit of imagination-boost will help potential tenants to envision the possibilities of the space. It’s a powerful image that would certainly inspire business owners more than an empty, desolate retail space ever could. The council plans to put up more fake shopfronts to support commercial areas in several towns. At around £1500 per shop, it’s a quick, inexpensive and completely reversible way to spruce up a deserted-looking shopping center. If the project seems familiar, maybe it’s because it’s eerily similar to an art project that took place in Toronto in 2008. Artists Dan Bergeron and Gabriel Reese put together A City Renewal Project to call attention to the changing landscape of their city. 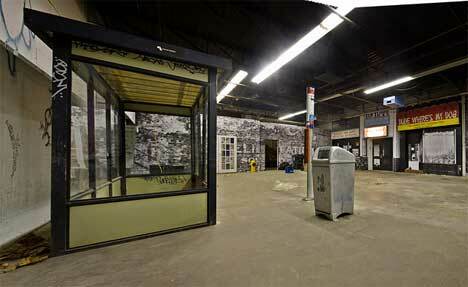 They took over a warehouse and filled it with fake storefronts; the entryways were full-size prints of real deserted businesses from around Toronto. The pair – and their crew of assistants – carted in just about everything you could expect to see on an actual city street: rubbish, graffiti, leaves, bicycles, billboards, and even an old streetcar shelter and bus stop. 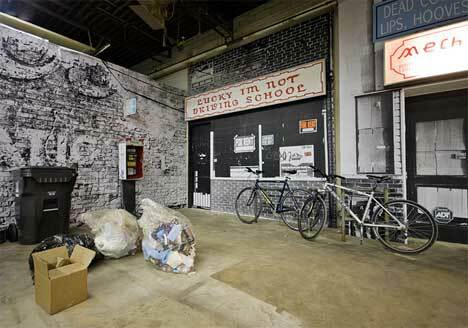 Even the entrance to the warehouse was invented by creating a false storefront called “Mr. Loogie” for visitors to enter through. The temporary city street was constructed in a block that was slated to be demolished to make way for a new condominium complex. 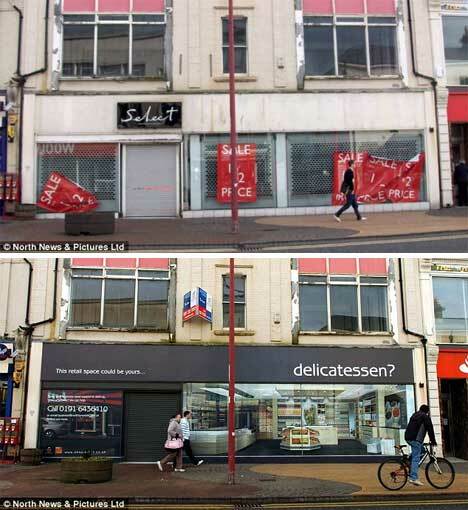 But unlike the false shopfronts in North Tyneside, these imaginary shops were there to bring all eyes to the troublesome practice of demolishing history, rather than concealing the changing business landscape from residents.